The greatest joy of summer is the availability of delicious locally grown berries, their smell epitomises summer and I am always trying to think of new ways to use them. These tarts remind me of every trip to France I’ve ever been on, as you will see a vast array of different combinations of fruit tarts all filled with gorgeous crème patisserie in every bakery there. This is my version of the French classic. Rub together the flour and butter, stir in the caster sugar and make a well in the centre. Add in the egg yoke and enough warm water to cause the pastry to just come together, form into a ball and wrap in cling film and leave to rest in the fridge for 20 mins. Roll out the pastry and cut out circles, big enough to line your tartlet tins. Line the tartlet tins with pastry, insert parchment paper and baking beans and bake blind for 10/15 mins, remove the beans, egg wash the base and return to the oven for another 5 mins until the pastry is nice and golden. Whisk the egg, yokes and caster sugar until pale. Sieve in the cornflour and whisk again until fully combined. Heat the cream and milk together with the vanilla pod and seeds/vanilla extract until just on the verge of boiling, do not let it boil. Remove the vanilla pod, if using, at this stage. Now add the liquid to the egg and sugar blend and whisk. Return to the pan for another 5 minutes, continuing to whisk all the time until the cornflour is cooked and the mixture has thickened. allow to cool and refrigerate until need. 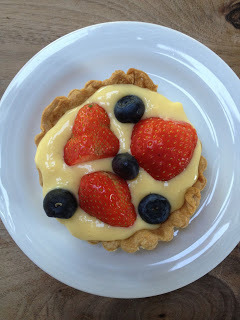 To assemble, spoon the crème patisserie into the tartlets and top with any combination of berries. An additional extra would be to heat some apricot jam and glaze…this give a lovely shine to the tarts.